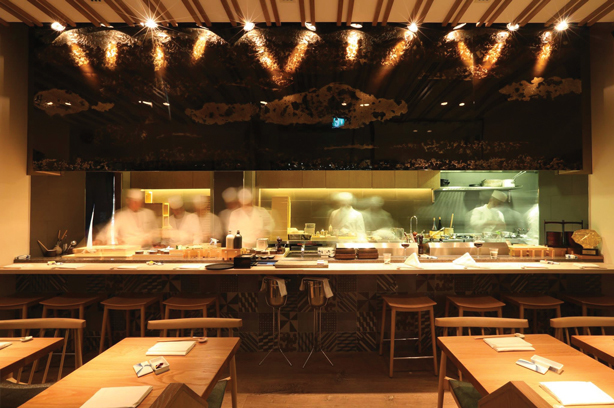 Engawa is the place to take a client who will appreciate high-quality Japanese cuisine, with genuine Kobe beef and the perfect sashimi box. Tokyo has several tiny restaurants that produce Michelin quality food. Typically they are unpretentious and almost always booked up. Japan’s Ministry of Economy, Trade and Industry has supported the creation of a number of small to medium-sized businesses to showcase the best of Japanese culture and cuisine around the world. One of them is Engawa. It’s very much tucked away and has a café feel to it – you can sit at the counter and watch the chefs at work. The service is professional, efficient and not intrusive. Its main claim to fame is that it’s the only restaurant in London that serves genuine Kobe beef – the most expensive beef in the world. It lives up to the billing – delicious, tender and sweet. Beef notwithstanding, for me the real treat at Engawa is the sashimi box. Inside lie variations on the theme including at least three different cuts of tuna matched with multiple relishes, pickles and tasty bites. If dining à deux, I recommend that one person goes for the Kobe beef, the other for a sushi option, and that you share. Lunch for two can be had for less than £100 before drinks – the wine list has decent options and, unlike many restaurants in London, is not ridiculously over-priced. Chances of a last-minute booking? It’s not simply a place to see and be seen; the surroundings are not what Engawa is all about, so bring a client who will really appreciate the cuisine. If you want to transport yourself to Tokyo without jumping on a plane, this is the place to go.